Two canoe journeys. 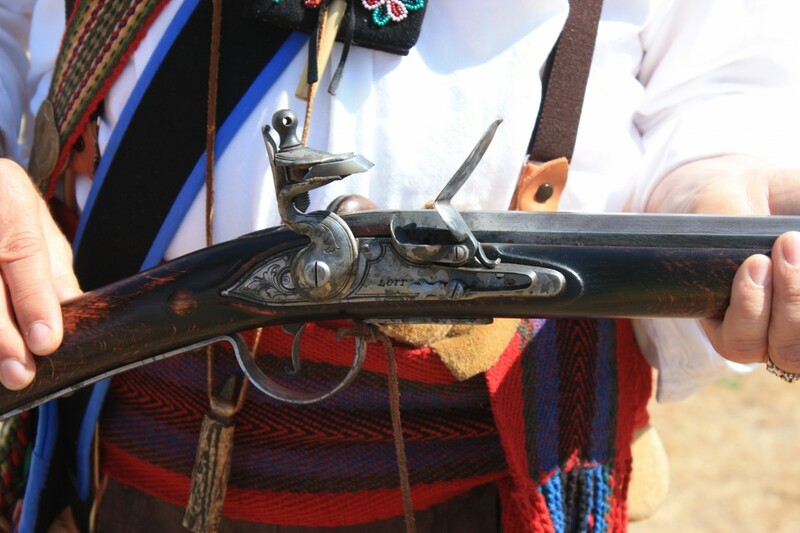 An image of the Voyageurs who paddled the canoes, and his always present flintlock gun. This is the same type of gun that John Lee Lewes would have used to shoot the deer outside York Factory. This is the beginning of a new series, which covers two separate canoe journeys made from York Factory, by different routes to the West side of the Rocky Mountains. The first is John Work’s journal of 1823, and he is going to Spokane House, on the Columbia River. 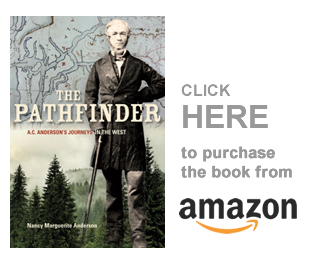 The second journal is that of Archibald McDonald, who traveled west with Governor Simpson in 1828. This second journal is new to me and very exciting. I knew it existed, and I would eventually look for it. Fortunately I stumbled on it by accident, in my local library. John Work, Journal July 19 to October 25, 1823, Manuscript, A/B/40/W89.1A [Transcript], BCA. John Work’s companions on this canoe journey are Peter Skene Ogden, and John Lee Lewes. July 1823, Friday 18. Having received orders to that effect I embarked with Mr. [Peter Skene] Ogden for the Columbia with two light canoes four men in each. Mr. Lewis [Lewes] also embarked with us for Cumberland House. It was one o’clock when we embarked. The day was fine and we got on well. We stopped near Penny cutaway. Mr. Lewis killed a deer near York. Saturday 19. Very warm weather though blowing fresh from the Southard. Embarked early this morning and got on very well. Passed some Indians from whom we got a little fresh Venison. Muscatoes very plentiful and very troublesome both last night and today. Stopped for the night a good way up Hill River. Sunday 20. Wind Southerly. Sultry very warm weather. Set out early this morning and made a long days work. Stopped for the night a little above Halfway Creek in Hill River. Passed Mr. Hutchison and six loaded canoes in the evening. Heavy thunder and lightning and very weighty rain in the night. Monday 21. Cloudy cold in the morning, but warm & sultry afterward. Showers in the evening. Embarked early this morning and came to below the Swampy Portage, which is a long days work. Met Messrs [John Hodges] Spencer & [Robert?] McVicar at noon at the Rock Portage. It was an immense pour of rain in the night with thunder and lightning. Tuesday 22. Cloudy. Wind variable. Set out early this morning and reached the old Depot in the Knee Lake, which is a good days work. In the morning we met six canoes loaded with furs from the Athabasca. Wedy 23. Cloudy warm weather. Wind SW. Embarked early this morning and arrived at Oxford House a little before sunset. Our progress was considerably retarded by strong head winds. Peace River. A Canoe Voyage from Hudson’s Bay to Pacific, by the late Sir George Simpson, in 1828. Journal of the late Chief Factor, Archibald McDonald, who accompanied him. Edited by Malcolm McLeod, Barrister. [Ottawa: J. Durie & Son, 1872] I think this book might have been republished at a later date, but we do not have it in our library here. Saturday, 12th July . At one am the crews of two “Light Canoes,” consisting of nine men each, were in motion, carrying the provisions and baggage to the water side; and in a few minutes after, the Governor in Chief, Dr. [Richard Julian] Hamlyn and myself, were accompanied down to our craft by fourteen commissioned gentlemen and about as many clerks. After something more than the usually cordial shake of the hand from all present, we embarked with three cheers under a salute of seven guns from the Garrison, and against a strong tide, were soon round the first point by the free use of the paddle and one of its accompanying “voyageur” airs…. Breakfasted on Twenty Mile Island at eight [am]. Took luncheon two points above Pennycataway River at one o’clock. Weather clear and warm. A few mosquitoes in evening. Encamped at the mouth of Steel River precisely at eight. The arrangement of the march has been handed over to us by the Governor. Doctor and myself, each night in turn, watch time, that we may start exactly at two in the morning. Men to have drams four times a day… In the afternoon met two Athabasca loaded canoes. Sunday 13th. Within a few minutes of two, the call was given, and precisely at the hour, were under weight. With very little exception the men, the whole of the day and yesterday, “on the Line.” The beach is fine and dry, but water remarkably low. Breakfast at eight, dinner at one, which last stoppage merely occupies from eight to ten minutes, that the men may swallow a mouthful of pemican, while the servant cuts off a slice of cold something with a glass of wine, to which the Governor invites one of his fellow travelers to partake of, as we move along and spend the remainder of the day on board his own canoe; the other makes a very good shift to eat and drink something of the kind alone. About this time to-day we got Colin Fraser to give us a few of his favorite strathspeys on the bagpipes, that went off very well to the ear of a Highlander, but as yet makes but a poor accordance with either the pole or the paddle. This decent young man [Colin Fraser] is lately from the Highlands, and on this voyage, accompanies the Governor in the double capacity of piper and assistant servant, &c. In the afternoon, met the boats from English River, put ashore at eight, in a very good encampment, near the Sugar Loaf Bank. Country hereabouts all on fire. Monday 14th. Under weigh exactly at two. Breakfast at Half-way Creek. Arrived at Rock [portage] at half-past three in the afternoon. Had a peep at the Rock [post], an old establishment with its gardens. Encamped late at the upper end of still water. Met three Athabasca boats about noon. Tuesday 15th. Shortly after leaving camp this morning, we passed a number of Indian families, living here the best way they can, till their husbands return from a trip to Norway House with goods. In course of the day, while going up Hill River, spoke [Alexis] L’Esperance with two boats, Joe Bird with two, and Joe Cook two, all for Red River. From the foreman took two kegs of spirits for the use of our party. Entered Swampy Lake at four, and encamped at Second Carrying place. Reached Jack [Jack Tent] River at the usual hour for camping. Wednesday 16th. Commenced the passage of Knee Lake this morning at half-past three. Were abreast of the old depot at six. The small canoe dropping greatly behind, after rounding the Knee, the crews exchanged canoes by way of trial. The Governor’s men with much ado, pushed the small canoe ahead. A gust of wind, accompanied with rain and lightening, put us ashore, where we remained for two hours. Arrived at Trout Fall by eight, and met the “White Governor [a soubriquet of the man at the head of the boat brigade] and a party here. They took twenty-seven days to Jack River (Norway House), and this is their ninth day downwards. Their cargo is robes (buffalo), and a few packs of “rats.” [muskrats] Governor Simpson bespoke two Indians to go down to meet L’Esperance, and replace two disabled men in his boats. So both canoes journeys reached Oxford House in safety, with John Work taking six days, and Archibald McDonald a little less. That is to be expected, as Governor Simpson always used the best of the voyageurs available to him. I have written about many of these characters before. We can look forward to seeing these incidents in this journal, that is, Archibald McDonald’s journal. For both of these canoeing parties, their journey west would lead them to Norway House and across Lake Winnipeg to the Saskatchewan River. From there they would continue to follow the routes of the incoming York Factory Express west to Cumberland House. At this point these canoers left the Saskatchewan River, and branched off on the old North West Company route via Methy Portage, Clearwater River and the Athabasca River. Once on the shores of the Athabasca, these two parties would go their separate ways — one northward to the Peace, the other westward to Athabasca Pass. That will make a bit of a problem when we get to that point of separation, but I will figure out what to do when we get there. Until then, enjoy the journey. I believe in one of Work’s journals there is one of the few first-person descriptions of David Thompson. He think made his observation when he was in La Chine. I dont know about John Work (but will ask his descendant here) A.C. Anderson described David Thompson as an old man at Lachine in 1831-32 — called him decrepit, which he may have been. But A.C. was only eighteen years old at the time, and any old man would have appeared decrepit to him. Its in Beaver Magazine, “Life at Lachine,” June 1952. He actually wrote a very good description of the parties at Lachine House when he was there. Hi, Jackie. Then you will enjoy this journal. Have you read it before? I also have Simpson’s 1828 journal to add to this when it is appropriate. No I haven’t . Looking forward to this series. I am, too. Well, not that I don’t already know what’s in it. But it will be fun to write.